Include the words "OKAY TO AIR" in your tweet/email for a chance to have Johnny answer your questions on the show! Follow the updates on the WEBSERIES SEASON ONE KICKSTARTER! In August of 2011, after far too long away, Susan and I began hosting RPG nights. I was the GM, and I was trying to create the most immersive experience possible for the players, in a way I never had before. I had tactile in-game currency, full 3D models of towns and buildings for battles, and I supplemented the gaming sessions with original, custom audio files to provide ambience, music, and even a "live" DJ who'd get news on the players' exploits and report on them to the world at large. I asked for volunteers to do voices for the DJ and several NPCs on Twitter. Doled out the roles in the order people said they'd help out. And we created a monster. Johnny Franks quickly became beloved by all, and while life and time restraints put our RPG on hold, we grew to miss the bloviating blowhard. 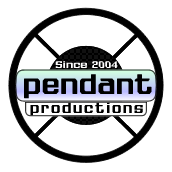 And then Susan and I got to thinking that he and his show would make a fantastic new style of audio drama at Pendant... and here we are. We hope you grow to love Johnny as much as we do, and enjoy getting to know him and the denizens of the crazy world he inhabits. Co-creator, co-writer , "Active Radioactive Radio"
The Active Radioactive Radio wiki entry, complete with full episode cast lists and summaries! Pendant show "Active Radioactive Radio" wins the Best Video Story category of the 2018 Parsec Awards! Melissa Autumn Hearne as Lt. Lucy in "Active Radioactive Radio"
Jack Calk as Johnny Franks in "Active Radioactive Radio"
Winner of 2018 Pendy Award for Best Supporting Actor in "Active Radioactive Radio"
Kathryn Pryde as Oksana in "Active Radioactive Radio"
Jessie Moore as Remmick in "Active Radioactive Radio"
Winner of 2017 Pendy Award for Best Supporting Actor in "Active Radioactive Radio"
Jeffrey & Susan Bridges for "Active Radioactive Radio"
Winner of 2016 Pendy Award for Best Supporting Actor in "Active Radioactive Radio"
Remmick’s got Lotus’s number, Katryna and the Ravagers reach an agreement with Janice and the L.T., Gustav displays heroics, and Johnny breaks out of his comfort zone! Featuring “New World” by Addis Browne! Johnny’s idle thoughts get him in trouble with Lotus, Janice and the L.T. get in a stealing war with Katryna and the Ravagers, and Remmick’s on the hunt! Featuring “I Won’t Sleep” by Caiti Baker! The audio drama's become a webseries! Johnny's coming to you on video, and he's brought the whole gang along with him! Remmick, Janice, Lt. Lucy, Katryna, Oksana, Ravagers Rodney and Roger, and even Joe are here direct from Leffdon for your amusement! Featuring “Star Up” by Barbra Lica! The cast and crew of Active Radioactive Radio discuss the making of season one! "Active Radioactive Radio" theme taken from "Main Stem"
by The United States Army Band "Pershing's Own"
Johnny's got a surprise, Haven's presence is felt, Barstow falls into chaos and Remmick makes a difficult discovery! Johnny gets a special message, and Remmick's all broken up! Johnny's torn, Julio and GX-500 strike while the iron's hot, and things take a turn for Remmick and Dexter! Johnny hits a roadblock, the Ravagers get gnarly and Remmick finds what she's been looking for! Johnny finds love, Remmick branches out and Dexter gets a job! Johnny spoke in haste, lady entrepreneurs of the wastes team up, and Remmick and Dexter make a connection! Johnny fights his vices, Lt. Lucy screams into the void, Remmick puzzles it out and Dexter's got the blues! Johnny's lonely, a menacing militia is forming, Julio and GX-500 introduce themselves, Dexter's hungry and Remmick makes a startling discovery! Johnny's back with more NEWSIC, Janice says hello, Remmick's getting worried and Dexter's on the move! Welcome to the wasteland! Johnny Franks has all the news and music a survivor of the apocalypse could ask for. Plus, meet delightful denizens Oksana, Katryna, Remmick and Dexter! Have a drink, Johnny's buying*. (* - No he's not).